The demand for processing large amounts of data has increased over the last decade. As traditional one-processor machines have limited computational power, distributed systems consisting of multitude of cooperating processing units are used instead. An example of such a massive distributed cooperative computation is the SETI@Home project . As the search for extraterrestrial intelligence involves the analysis of gigabytes of raw data that a fixed-size collection of machines would not be able to effectively carry out, the data are distributed to millions of voluntary machines around the world. A machine acts as a server and sends data (aka tasks) to these client computers, which they process and report back the result of the task computation. This gives rise to a crucial problem: how can we prevent malicious clients from damaging the outcome of the overall computation? 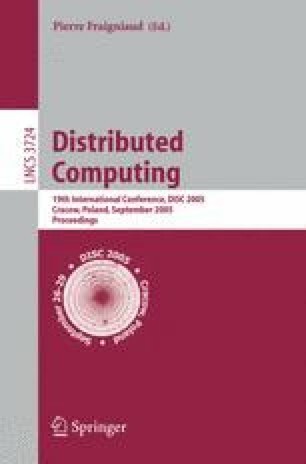 In this work we abstract this problem in the form of a distributed system consisting of a master fail-free processor and a collection of processors (workers) that can execute tasks; worker processors might act maliciously. Since each task returns a value, we want the master to accept only correct values with high probability. Furthermore, we assume that the service provided by the workers is not free (as opposed to the SETI@Home project). For each task that a worker executes, the master computer is charged with a work-unit. Therefore, considering a single task assigned to several workers, our goal is to have the master computer to accept the correct value of the task with high probability, with the smallest possible amount of work. We explore two ways of bounding the number of faulty processors and evaluate an algorithm that the master can run. Our preliminary analytical results show that it is possible to obtain high probability of correct acceptance with reasonable amount of work.